From Tabgha, we walked a short way down the road to the chapel of the Primacy of Peter. 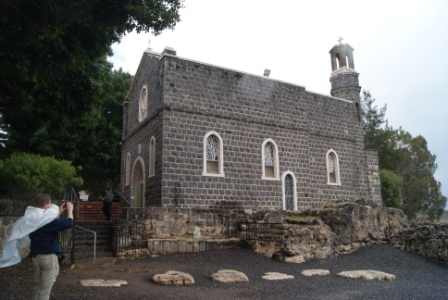 The small church is set atop a giant rock at the very edge of the Sea of Galilee, which is supposedly connected to the story told in John 21. After the resurrection, Jesus appears to the disciples at the shore, redirecting their empty nets to the other side of the boat for a miraculous catch of fish; frying them up some breakfast; and installing Peter as the leader of his post-resurrection followers by telling him three times to “feed my sheep.” This rock was a likely stopping place for all the fishermen, a place to rest and eat and prepare the catch for market. The rock inside the chapel. 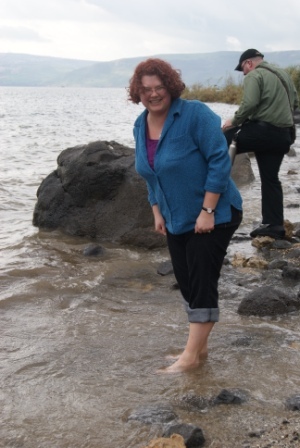 My favorite part of the chapel was its proximity to the Sea of Galilee. Those who know me well know that I had to get my feet in the water immediately. This made my day. From there, we got on the bus for a two mile trip to the ancient town of Capernaum, the site of so many stories in the Gospels. It was Peter’s town, where he and his mother lived and his fishing business thrived. It was Jesus’ central location in his Galilean ministry, where he healed the paralytic, taught in the synagogue “as one with authority,” called the disciples, and spread his message throughout the region. 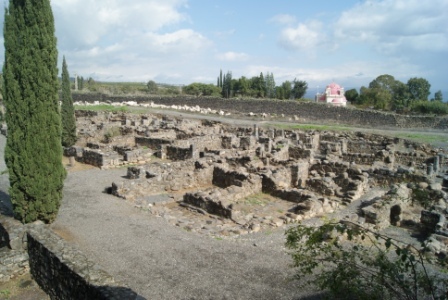 The town of Capernaum. 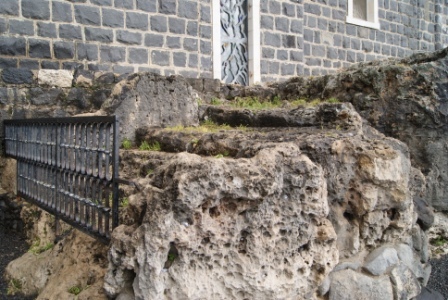 The black, volcanic stones are from the first century (Jesus' era), and the white limestone at the back is the 5th century synagogue. The site itself is an archeological excavation of the majority of the first century town. You can see the foundations of the homes and buildings and alleys that Jesus would have known. There is a synagogue there. 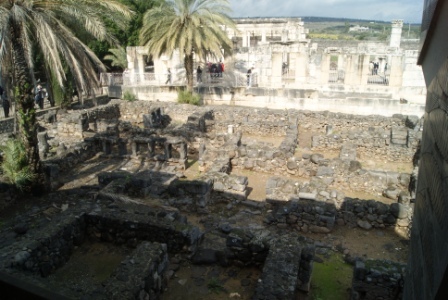 Although the current reconstruction is of the Byzantine synagogue, it was built upon the ruins of the first century synagogue that would have been the site of Jesus’ praying and teaching. You can see those foundation stones, and walk around the same floor plan in a synagogue where Jesus would have prayed and taught. I was impressed by its size (bigger than our sanctuary!) and by all that remained of it. 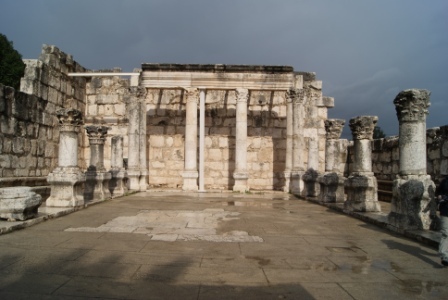 The synagogue at Capernaum. The pillars and stones have been reconstructed from the remains of the 5th century building lost in an earthquake. 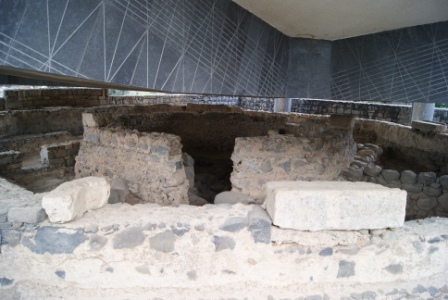 The floor plan is likely similar to the synagogue on the same site in Jesus' day. The small back door would have been the women's entrance. These stone benches are reconstructed from the original. I gained a new appreciation for Peter’s primacy in Capernaum. His house forms the heart of the holy site. This place is a less “supposedly” site. When the Byzantine Christians arrived, there was a Christian church there, a home that had been converted into a house church. It makes sense that this would have been Peter’s home, converted into a church by the early apostles. When the Byzantines excavated, they found the home itself and built an octagonal church around the remains. That was destroyed by earthquake in the eighth century, and rebuilding was forbidden by the ruling powers until the 20th century. When the Franciscans did reclaim their right to build after the 1948 war, they constructed a modern chapel hovering over the remains of the house, house church and octagonal Byzantine church. 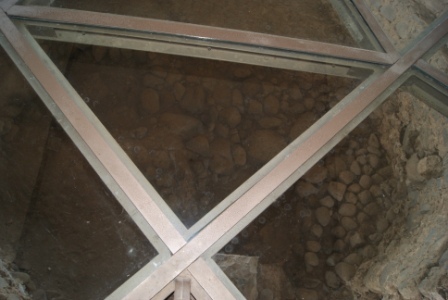 The chapel has a glass floor looking down into the remains. View from the ancient synagogue looking back to the modern church hovering over the ruins of Peter's house. 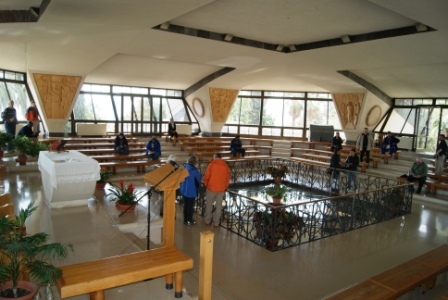 Inside the modern church, with the glass floor at the center. Looking through the glass floor into Peter's house. Our tour guide Claudia gave me new insight into Peter’s life and livelihood. Contrary to what I’ve always thought, there is no reason to believe that Peter was a poor fisherman. He owned a sizable home, separate from his mother. 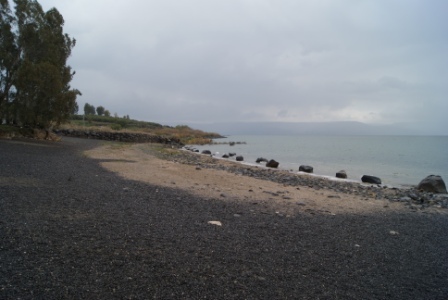 He owned a boat, which was a sure sign of wealth and success in a town like Capernaum, where most people had to do their fishing from the shore. He was also the only one who entered the high priest’s house at Jesus’ trial, which leads one to believe he had connections. He was likely a wealthy and powerful leader in Capernaum in Jesus’ day. 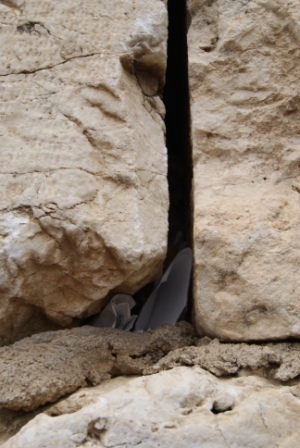 Peter must have shared that wealth and power abundantly with Jesus, providing him food and shelter, opening the access to the synagogue, and using his influence to protect Jesus from the kind of threat he faced in Nazareth. Outside view of octagonal Byzantine church remains, with remains of Peter's house enclosed below and modern church hovering above. In this description, I recognized Peter immediately, in the solid, go-to leaders in the congregations I have known. Every church has a few individuals who keep the place going. It might be their generous gifts, their hard work, their leadership, or their courage. Occasionally, like Peter, it’s all of the above. I have known several Peter-like figures in my ministry, and they are a great gift. They have wealth and connections and influence, yet it is always used in the service of others and the church, not for their own gain. They are willing to lead and take risks, and others follow because of their faithfulness and humility. I found myself remembering these Peter-figures, in my church and in other churches I know and love. I prayed for these women and men by name, in Peter’s synagogue and beside his home. I prayed that the church would be blessed with more leaders like Peter, with the resources and faithfulness they bring to Jesus’ mission. This is not the Western Wall, but the rear exterior wall of the Capernaum synagogue. It also had paper prayers stuffed inside. I stood here and prayed for the Peter-like leaders in the churches I know and love. I also came to appreciate a different aspect of Jesus’ ministry—his attention to strategy. I always attached cunning political theater and community organizing to his Jerusalem pageant, but this took it back to Galilee. 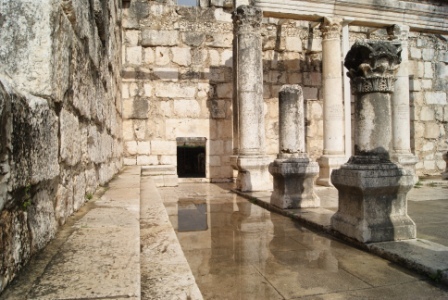 Why did Jesus choose Capernaum when he got kicked out of Nazareth? It was one of the largest towns around, and perhaps he had already developed a friendship with Peter. 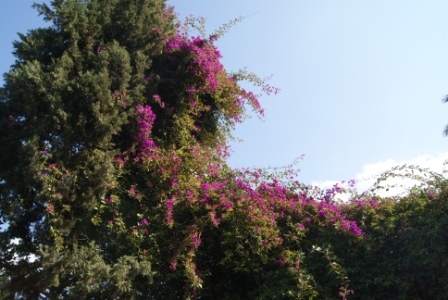 Capernaum is located along the Via Maris, the major Roman highway to Damascus, so news of events in Capernaum would quickly spread throughout the region. There is evidence for that in the crowds that quickly flocked to him there in search of healing. He knew he could find supporters, access to a bigger audience at the synagogue (Nazareth only had a few hundred residents, Capernaum had several thousand), and chances to grow the mission. Can you imagine daily life in this bustling first century town? It is tempting in the church to divide our conversations about strategic planning, church growth and giving from the more “sacred stuff,” like worship or Christian education. However, even Jesus paid attention to strategic decisions that would help grow the ministry. The energy and time we devote to ministerial strategy is not about self-aggrandizement, it is about spreading the word of Christ. And he did it too. When we arrived, the monks were holding a mass in the modern sanctuary, so we could not enter. 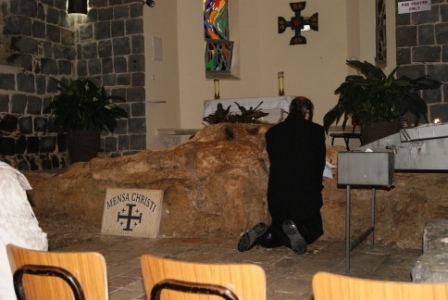 As I walked around, I heard them singing a song that resembled the praise tune, “Holy Ground.” Tabgha felt like holy ground, like an altar for worship and reverence. 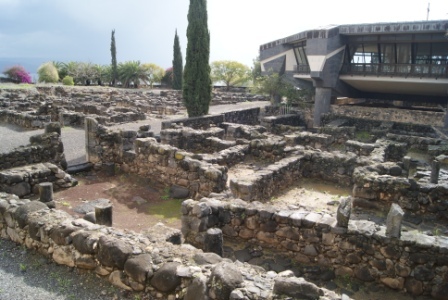 Capernaum felt more like the church kitchen and meeting rooms—the place where daily life in the church happens. It felt like where decisions get made and fellowship takes place, where the chores of fishing and working and tending animals exist side-by-side with the sanctuary of prayer and the mystical experience of healing; where children play and people are fed and God is made known in the midst of all of it. This, too, is indeed holy ground. After all, the heart of site is just someone’s house, transformed by their willingness to open their home and their lives to Jesus. May we all be inspired by Peter, to use our resources, our homes, our lives, as places for Jesus’ mission to grow. One thing that pictures can hardly convey is simply how beautiful the landscape is here in the Galilee. Just beauty everywhere. 1 Response to "Day Two: Primacy of Peter and Capernaum"
Love you!!! Really related to the Peter comments. I have always taught about Peter’s profound strength and courage as well as his brashness.